The Texas House of Representatives is composed of 150 members, each elected for a two-year term. 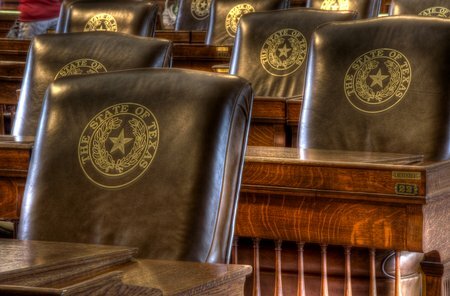 The Texas Legislature meets in Regular Session for about five months every other year. Regular Sessions begin at noon on the second Tuesday in January of odd numbered years and can last no more than 140 days, ending during the last week of May or the first week of June. Special Sessions may be called by the Governor and can last up to 30 days. A member of the house must be a citizen of the United States, must be a qualified elector of the state, and must be at least 21 years old. He or she must have been a resident of the state for two years immediately preceding election, and for one year immediately preceding election must have been a resident of the district from which he or she was chosen. At the beginning of each Regular Session, the members of the House of Representatives elect one member to serve as the presiding officer--the Speaker of the House. Location: The Texas Capitol is located on N. Congress Avenue between 11th and 15th Streets in downtown Austin (click for map).